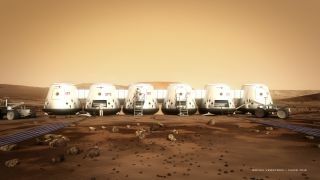 Artist's concept of Mars One astronauts and their habitat on the Red Planet. The nonprofit Mars One announced on Aug. 5, 2014 that it's starting a program called "Mars Exchange" to answer questions and spur dialogue about its ambitions colonization plans. LONDON — It's a one-way ticket, but don't worry: You'll live there longer than back home on Earth, says Bas Lansdorp. After all, on Mars you can't get hit by a car. And everything you'll eat will be organic — no pesticides, just fertilizer made from, well, recycled human waste. As he addresses a room full of entrepreneurs, Lansdorp — founder of the Mars One colony project—looks as excited as a child. He is here at a recent International Space Commerce summit to promote his out-of-this-world idea, a one-way trip to the Red Planet, and possibly spark the interest of investors. The audience of suited-up men and women watches Landsorp speak, every now and then a sarcastic question pops up. "And have you thought about space radiation?" asked one listener. Lansdorp has also thought through the entire time scale of what will happen when. More than 200,000 candidates have applied already, and sometime this month Landsdorp is expected to announce who's made it into the second round of selection. "I started Mars One because I wanted to go, and I still want to go to Mars, but I had my first son a few weeks ago," Lansdorp answered. "But it's not even the main reason. I am just not that kind of person who can be locked up in a small room for 30 months with other people without hating each other." "But I really hope I will be able to take my family to Mars one day," he added. Lansdorp's vision evokes the image of a Ray Bradbury story "The Million-Year Picnic" in the book "The Martian Chronicles." Lansdorp's plan is very similar, except that in real life the Mars One crew won't have canals filled with water when they reach their destination. Nor will there be any breathable atmosphere. "The rovers will activate life support systems, they will feed them with Martian soil, which has ice crystals in it. This water will evaporate, and to make oxygen, we'll take nitrogen from the Martian atmosphere. We'll create an atmosphere," Lansdorp said. That may work, technology permitting, and Lansdorp is sure it'll happen. But he is also certain that the Mars One colonists who leave Earth will be just like the folks in Bradbury's tale: They'll be Martians. There may be more than 200,000 people happy to leave Earth (those who applied to the Mars One project online) but those that actually do make the trip, will never be coming back — even if they manage to build a rocket to return. "They will lose bone mass and muscle mass to such an extent that it will be extremely difficult for them to gain it back to survive a return trip to Earth and then the re-entry into the Earth’s atmosphere. "They'll be Martians for the rest of their lives," Landsdorp said. Mars One is a not-for-profit organization that will establish a human settlement on Mars through the integration of existing, readily available technologies from the private space industry. To get his venture up and running, Lansdorp needs money. Initially, he plans to finance it by turning the venture into a reality TV-like show, with people back home on Earth watching in real time the departure, the several months long trip, the arrival and the life at the first human outpost away from Earth. So how much will it cost? About $6 billion to get the first four people on Mars and $4 billion for every crew that follows, says Lansdorp. But that's feasible, he added, because "the Olympic Games in London made about $4 billion in just three weeks of broadcasting, just because the world was watching. But this will be a lot bigger." Of course, the world won't be watching forever, and at some point viewers' interest will dwindle — unless everything on the Red Planet starts going topsy-turvy. And if it doesn't, Lansdorp is certain that money will still be flooding in, to support the human outcasts far, far away. "There is a small group of people in the world who have a lot of money," Lansdorp said with a cheeky smile. "There are 200 billionaires who can finance the trip from their net wealth. And if you have $6 billion in the bank, what are you going to do with it? You can buy a house, an island — but you'll still have $6 billion. "Well, we offer you to buy immortality." That may be well and good for Lansdorp's idealistic vision. After all, he isn't headed for Mars anytime soon. But for those Mars One colonist hopefuls, assuming they make it, survive and even have kids, there may well be another reality TV show in a few decades from now: one about the first few Martians desperately trying to get back to Earth, wondering whether their parents made a wise choice. One thing is certain: Those kids would have one heck of a story.